Introducing Nefarius by Asmodus,which is built for pure convenience and and performance into one little package. The Nefarius is a traditional Genesis style RDTA with a magnificent add-on, a squonk-able pin. The 510 pin was modified so that a micro hex screw can be removed to make the Nefarius a squonk-able tank making this the first Top Fill & Bottom Fill RDTA! 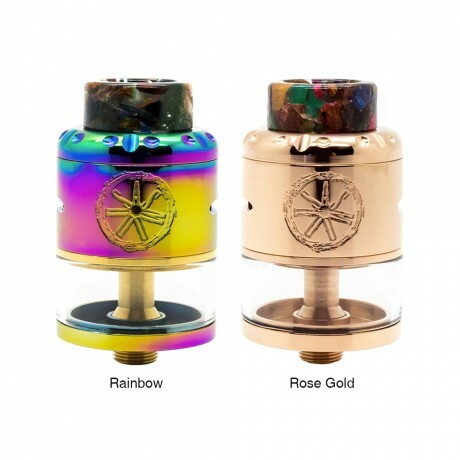 This allows the user to squonk straight into the tank with their squonker mod. The removable pin allows the user to switch from a squonker RDTA to a regular RDTA without having to rebuild again! The Nefarius S RDTA retains all the benefits of a traditional genesis such as tremendous flavor and vapor. It is a one worth your attention!